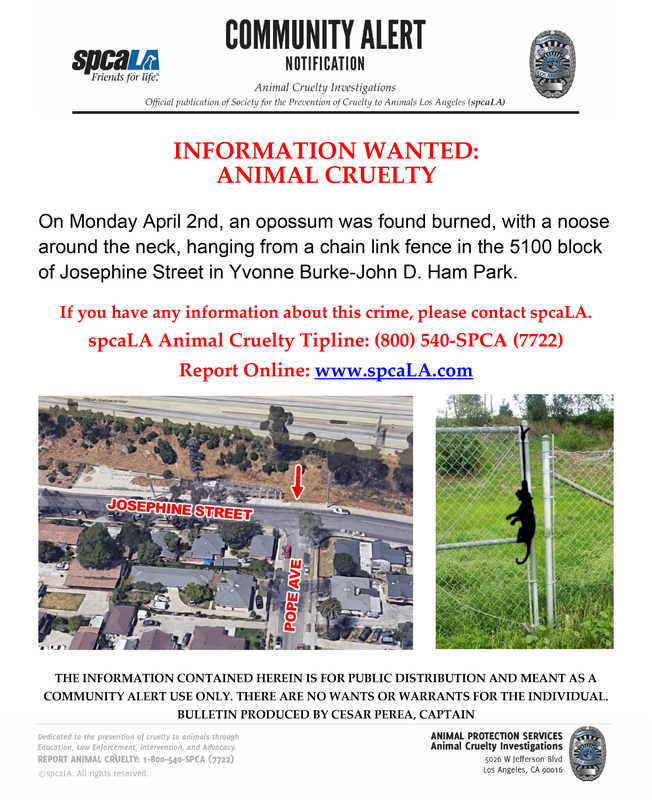 Los Angeles, CA – Animal Control Officers for the City of Lynwood will begin canvassing the 5100 block of Josephine Street looking for information related to a burned animal that was left on a chain link fence, hanging from a noose by the neck. The animal, an opossum, was discovered Monday, April 2nd in Yvonne-Burke-John D. Ham Park. Lynwood’s Animal Control Officers are assisting the Society for the Prevention of Cruelty to Animals Los Angeles (spcaLA), who is leading the investigation into this violent crime. In the state of California, animal cruelty can be prosecuted as a felony. The canvassing will occur over the next two days. Anyone with information about this incident is urged to contact spcaLA at (800) 540-7722. The animal’s remains have been sent for necropsy to determine the cause of death, and whether or not the animal was alive when burned. Other evidence from the crime scene is being processed for forensic evidence. spcaLA is the only private animal welfare organization in Los Angeles that is also Law Enforcement. spcaLA Humane Officers hold the same powers of Peace Officers in the state of California when investigating animal cruelty. spcaLA is a non-profit agency that relies on donations for its programs and services, including animal cruelty investigations. To donate, please CLICK HERE or call 323-334-4485.